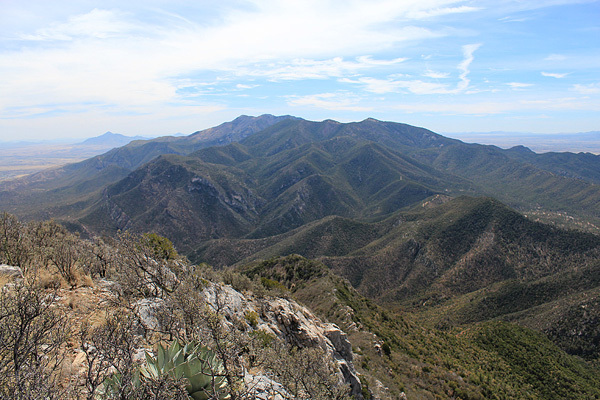 On Saturday, March 31, I led a hike of three peaks in the Huachuca Mountains for the Southern Arizona Hiking Club. 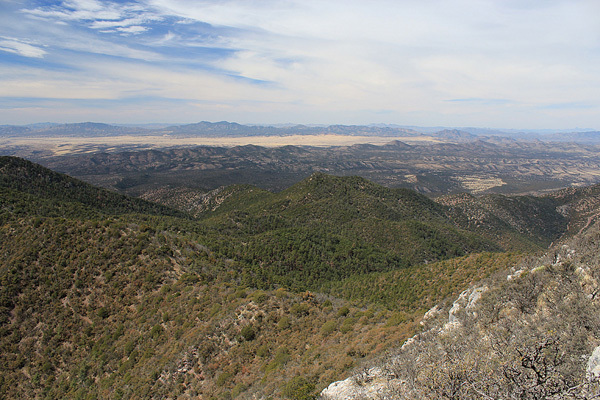 The Huachuca Mountains are prominent range lying immediately west of Sierra Vista, Arizona. 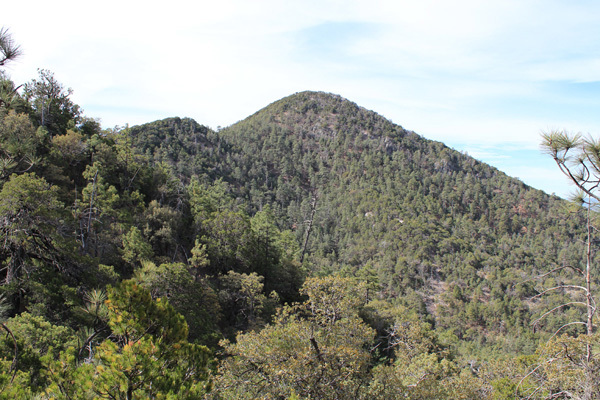 Our goals were to summit Huachuca, Lyle, and Peterson Peaks. June Meyer, Bill and Jane Hiscox, and Jeff Brucker rendezvoused with me early in the morning and loaded into my Jeep. We drove south through Sonoita and past Parker Canyon Lake to follow forest roads to the trailhead. On the drive towards Parker Canyon Lake we spotted pronghorn, deer, and turkeys. With that start to the day I wondered if we might encounter a jaguar later on the hike. The last few miles of driving was sometimes steep and rocky and we splashed through a few shallow creek crossings. But the road was easier than others I have driven on SAHC trips. Linda and I had scouted the drive a few weeks earlier and we found a cairn marking a faint trail at the location indicated on my topo map. When I arrived there this time Bill suggested I drive just a little further and by doing so we found the well-marked Crest Trail trailhead with ample parking. Our first goal of the day was to summit Huachuca Peak. 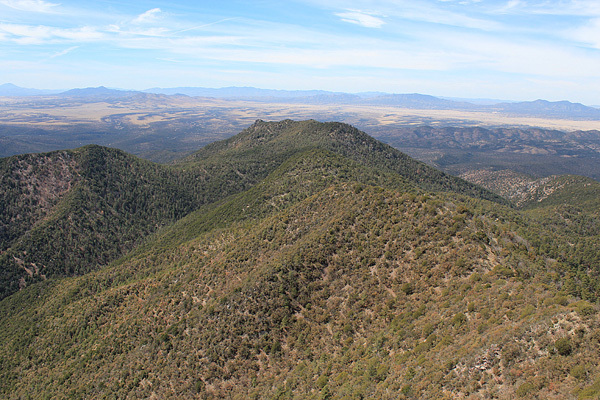 Huachuca Peak is not the highpoint of the Huachuca Mountains, but is still the 84th most prominent peak in Arizona with 1910 feet of topographic prominence. We climbed steeply up the Crest Trail in the warm sunshine to reach a ridgeline. Beyond there, the trail led north to a primitive gate that provided access to Fort Huachuca and an unmaintained trail leading the rest of the way to the summit of Huachuca Peak. The upper trails were mostly in shade with a pleasant cool breeze. After signing into the summit registry and taking photos we began our descent towards the trailhead. On the descent I missed two switchbacks where boot tracks continued straight, but my companions were amused to correct me. We made two side trips on our descent. The first side trip was to hike through thick forest to the summit of Lyle Peak. Any potential views were obscured by trees. We noted familiar names in the summit registry, added our own, and returned to the trail. From a forested saddle lower on the trail we made our second side trip to summit Peterson Peak. This required thrashing through thick forest up a steep slope that sometimes required climbing on all fours and using trees for hand and foot holds. 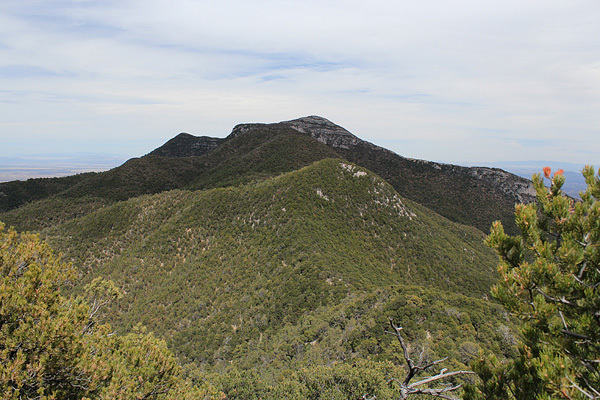 The summit was a small rock outcropping which at least provided a nice view of Huachuca Peak and a wet summit registry with the usual familiar names. We returned once more to the trail and descended the rest of the way back to the trailhead. It had been a very pleasant and productive day hiking in the scenic Huachuca Mountains, even if we did not meet a jaguar. 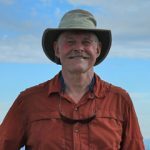 This entry was posted in Climbing, Hiking and tagged Arizona, Huachuca Mountains, Huachuca Peak, Lyle Peak, Peterson Peak, SAHC. Bookmark the permalink.